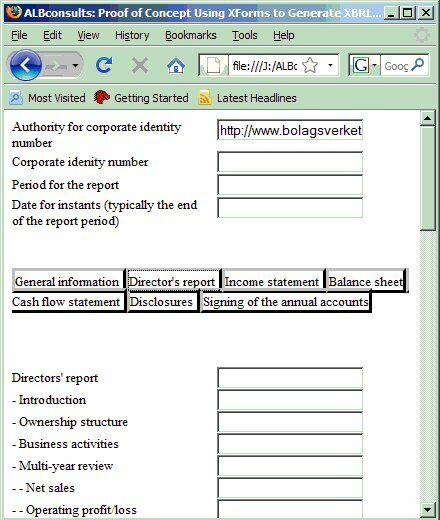 XBRL - the eXtensible Business Reporting Language - is a framework, based on XML, for creating applications reporting business data. These applications, specified as "taxonomies", include schemas as well as subsiduary information in so called linkbases, e.g. labels for human consumption, and references to books where the data items are defined. Numerous regulators, such as the SEC in the US, are starting to require the submission of reports using XBRL. Given the current economic situation leading to demands for more regulatory information to be made available coupled with the importance of analysis of the data in a timely manner this trend will quickly accelerate. Thus any company is likely to be needing to create reports using XBRL in the near future. On the longer term one can expect accounting packages to support the mapping of data to XBRL format. One can also expect mappings to be provided for common taxonomies together with the ability to create custom additions for the mapping of company specific data. In the meantime, however, other approaches to create XBRL need to be used. A number of vendors are proposing solutions based on Microsoft Excel spreadsheets. A template spreadsheet containing fixed information, such as the XML element names from the taxonomy of the information to be provided, is manually filled in with the information to be reported. The information in the spreadsheet is then extracted and converted to XBRL format. A promising approach is to use XForms (a World Wide Web Consortium standard) to capture the information to be reported. The form itself is generated from the information in the taxonomy with labels for the input fields taken from the "label linkbase". Once the form has been filled in an XSLT transformation is run to convert the information into compliant XBRL. The top of the form contains general information. It is followed by a series of tabs reflecting the subdivision in the taxonomy of the information to be gathered. It is quite common that information that needs to be reported to a regulator is "sprinkled" throughout a document created using Microsoft Word. One such example is a company's annual report. Using techniques first explored in the 1980s, where SGML was the target, one can extract and convert selected information into XBRL reported items based on style-names and fixed text in tables. It does, however, require care when creating the Word document.